The sun had set long ago, and hours after a jury found itself deadlocked in the first Freddie Gray case, the cold had started to settle. Only about 20 protesters had lasted this long. They had marched from the courthouse to City Hall to the City Juvenile Justice Center just a few blocks away. At this point, police far outnumbered them. Makayla Gilliam-Price, an activist in Baltimore, stood in front of those remaining demonstrators and looked right into their eyes, trying to remind them why they were here. Two police helicopters hovered high above them, flashing their search lights every once in a while. "If I make a wrong move, my life is gone," she said. A 16-year-old protester was arrested earlier, she said, and now he has been sucked into a system that has ruined thousands of black lives in this city. "Let him be your motivation," she said. Over the past eight months, Baltimore has been on an emotional roller coaster. 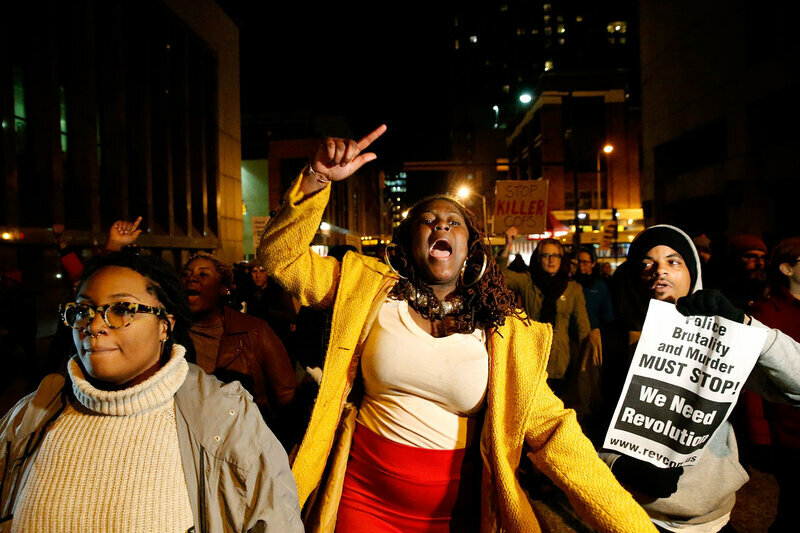 After the death of Gray, the black man who suffered fatal injuries in the back of a police vehicle, mass protests erupted and they culminated in a night of violence and destruction. A few days later, the city celebrated because Baltimore chief prosecutor Marilyn J. Mosby announced that she intended to bring charges against six officers involved in Gray&apos;s death. And a few days after that, the Justice Department announced it was launching a civil investigation into the city&apos;s police department. But on Wednesday, a judge declared a mistrial after a jury failed to reach a verdict in the case of the first officer put on trial. That fueled deep disillusionment amid the protesters. "You have days when you think you know the answer, you know the solutions," said Kelly Holsey, 31. "But then you have days like these, where you realize that you&apos;re working against a corrupt system."